Earlier this year I was very honored to be invited by the organisers of the XVII International Feofilof Symposium (Ekaterinburg, 23-28 September 2018) to present the findings of the CHIRALQUBIT project. It was a wonderful opportunity to interact with the Russian community of optical and magnetic resonance spectroscopy and to visit Russia for the first time. 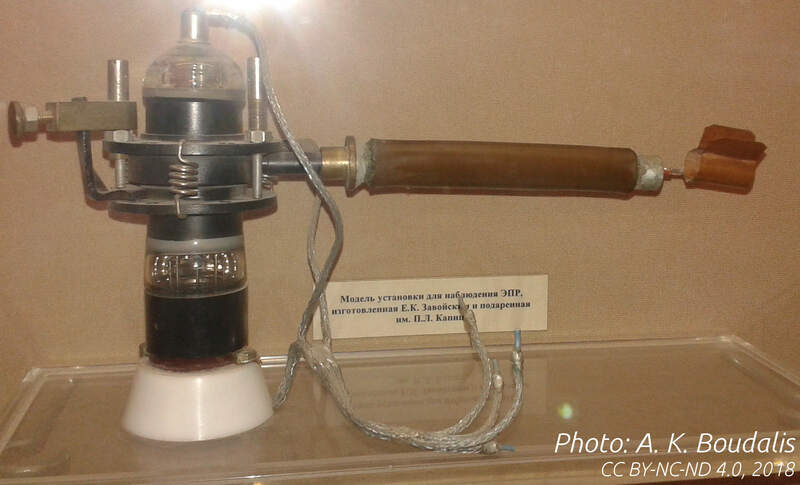 It was also a rare opportunity to visit the Evgeny Zavoisky museum in the Kazan Federal University, which hosts a remarkable collection of the original equipment used by Evgeny Zavoisky while he was inventing Electron Paramagnetic Resonace (EPR) in 1944. This collection is so important, that a some of the original equipment are exhibited at the Museum of History of Kazan University, the University's central museum. Kazan is situated ca. 800 km to the east of Moscow, not exactly next door from western Europe for someone who just wishes to pay a visit to the museum. But, conveniently enough, it is also ca. 850 km to the west of Ekaterinburg, just a 13-hour ride with the night train. The return trip by train following the Ekaterinburg-Kazan-Moscow route was the ideal way to visit the museum. The journey was worth every minute, not just for the destination, but also for the opportunity to travel and spend time with a few of the Symposium participants that were returning to Kazan. I had previously arranged my visit with Igor Silkin, the curator of the Zavoisky Museum. Upon arrival, me and some of the other Symposium participants from Taiwan and Japan, were guided to the museum by Roman Yusupov, located in the building that currently hots the Law Faculty. There, the museum's guide explained to us the experimental setup and talked yo us about E. Zavoisky's life and discovery of EPR. We were then guided to the central museum of the University, where some of Zavoisky's original equipment were on exhibit, along with an impressive historical collection of the University. I would like to thank Igor Silkin, Roman Yusupov and the guides of the museums for this impressive and memorable visit to the Kazan Federal University. Panoramic view of the reconstruction of Zavoisky's experimental setup. The signal is read out on the oscilloscope. 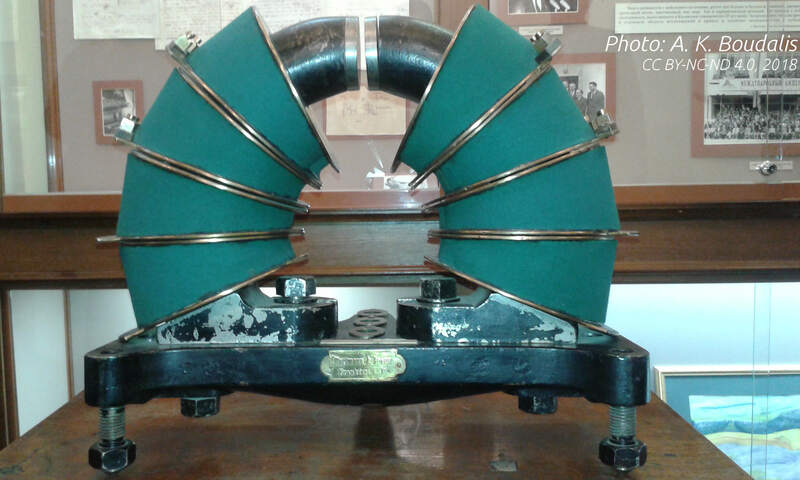 "The model of the EPR observation unit, manufactured by Zavoisky and donated by P. L. Kapitsa" (Museum of History of Kazan University). 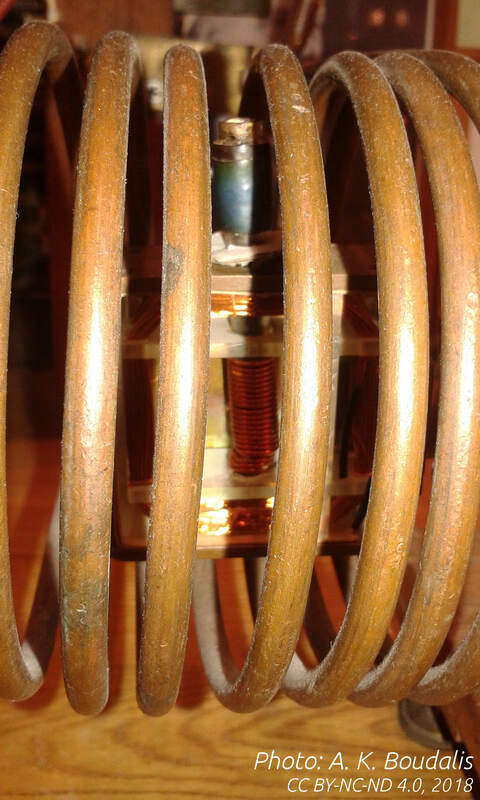 This is the loop-gap resonator invented by Zavoisky and used for the first ever EPR experiments at microwave frequencies (2.19-2.76 GHz, S band) published in: E. Zavoisky, Spin magnetic resonance in the decimetre-wave region, J. Phys., 1946, X(2), 197-198. A sketch of it is shown in: A. Schweiger, G. Jeschke, Principles of Pulse Electron Paramagnetic Resonance, Oxford University Press 2001, p. 4. The DuBois elctromagnet with a loop-gap resonator in its pole shoe. The plexiglass clamp with the screw was used to tune the resonator.